We’ve known that a Jeep pickup was coming for some time, and we’ve seen it, in disguise, testing in the real, filthy world. Now, we even have some leaked CAD files showing the new pickup’s frame and axle, and what seems to be confirmation for a 3.0-liter turbodiesel V6. Plus, it’s got a historic name: the Jeep Scrambler. We can also see the model code JT (which may or may not have been chosen as a tribute to me; if so, thanks) which refers to the Jeep pickup. That name comes from the iconic stretched Jeep-based pickup truck. Other screenshots indicate that a variety of tops will be available for the Scrambler, including a black three-piece hard top, a body-colored three-piece hard top and a soft top. These options should make the Scrambler the only convertible pickup truck available in America, at least without the use of a Sawzall. So far, only four-door mules have been seen testing. The length of this frame seems to suggest that only a four-door option will be offered, but that’s just a guess. 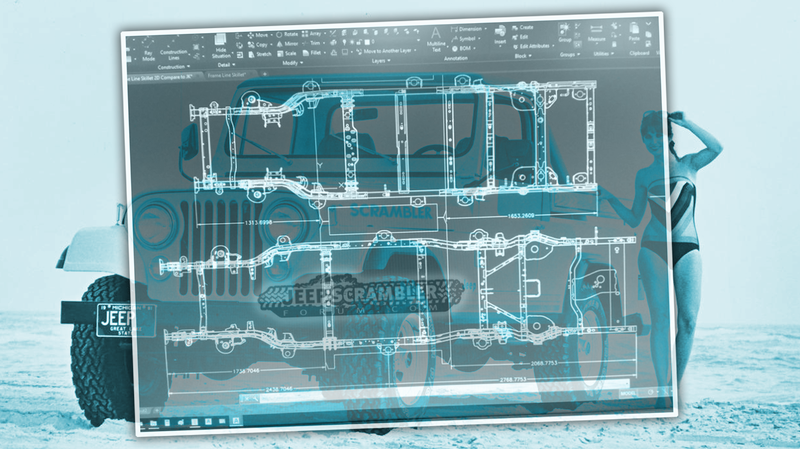 Based on a calculation of the measurements in AutoCAD, the images show the JT pickup truck’s frame (205-inches) will be approximately 18% (33-inches) longer than that of the 4-door JK Unlimited frame (172-inches), as the JT spy photos and video have shown. appear to be new Dana 12-bolt axles/diff which will add strength over the current JK Wrangler’s Dana 44 axle. This is sure to bolster the truck’s payload capacity and tow rating. If any of you out there are setting up a bootleg manufacturing facility in your basement, I’m sure these images are incredibly valuable. Do you have information about the new Jeep Scrambler, or any other upcoming car? Email us at tips@jalopnik.com.